Pansies again! I just love these bright little flowers with their happy faces nodding in the spring breezes. The new palette is perfect for them. A soft blue butterfly flits about among the blossoms. This 5"x7" watercolor painting is done using a palette of three colors: rose red, yellow and deep blue. 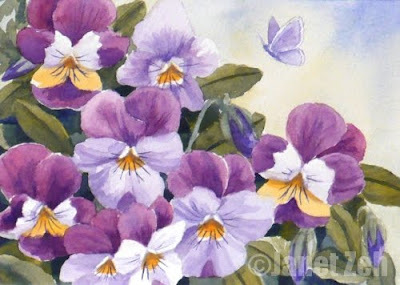 The original is sold, but you can find more of my small watercolor flower paintings at JanetZeh.Etsy.com. Thanks for stopping by and have a lovely day! This painting is just amazing. Catching the colors like this is really great. As being a synesthesian artist I live a life in colors. Synesthesia means that I see colors when I see words and numbers.I transform this in paintings of names and birthdays. You have a fascinating story! Just amazing. That's wonderful that you are using your ability as an artist. I really enjoyed looking at your work on your website.